Which Bag Sealer is Better? 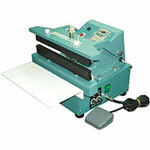 Impulse heat sealers are ideal for the sealing of poly bags and tubes. They are best used for low volume packaging production and can seal most types of common bags. To use an impulse sealer the operator must press the arm or foot pedal down, depending on the model or style of machine used. The bag or tube should be 2 inches smaller than the seal width of the impulse heat sealer. When sealing poly tubing an impulse sealer with cutter must be used. 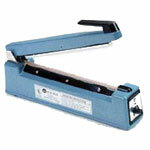 An impulse heat sealer with a standard 2mm seal will close a plastic bag 6 mil in thickness. 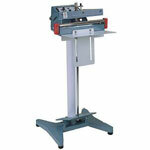 This increases to 8 mil thickness with a 5 mm width seal. 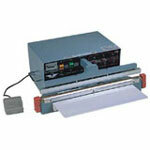 A double impulse sealer will seal poly bags greater than 10 mil. Boatman Marking offers a wide variety of impulse sealers from table top, to hand held and foot pedal operated, Boatman Marking will meet your specific packaging needs.